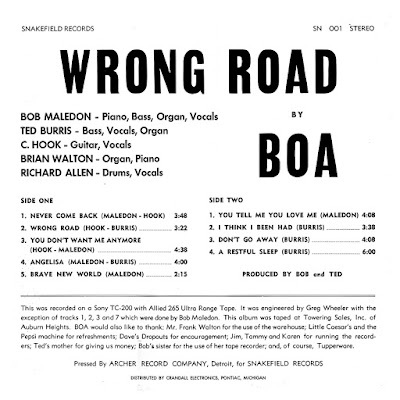 The roots of Boa can be found in Auburn Heights, Michigan in 1969 when high school student Ted Burris (bass, vocals, organ) enlisted fellow student Bob Maledon (piano, bass, organ, vocals), who he had seen jamming at a mutual friend's house. They met at Maledon's garage to play, where Paul Manning (guitar, vocals) heard the racket the twosome were making and had to be involved. The three continued jamming until deciding it was time to add other member. Brian Walton was recruited to play keyboards, and, after trying out numerous drummers, Richard Allen filled the drum seat. They called themselves Anvil and performed cover songs as well as a few band originals. In 1970 Anvil recorded an album at a Detroit studio that was never released, although a few acetates were made, before breaking up due to changing musical tastes. The members, however, got back together in 1971 and decided to give recording another shot. Instead of dusting off the Anvil moniker, the band chose to rename itself Boa. 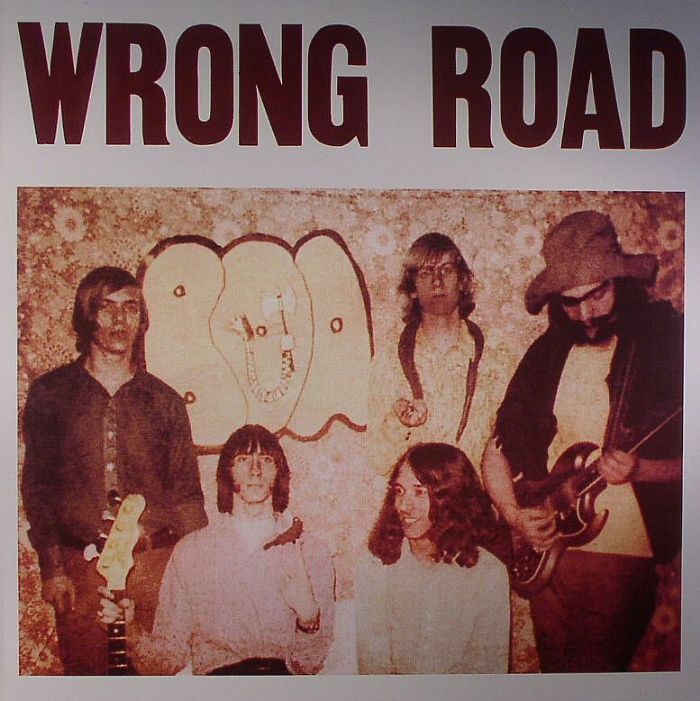 They recorded Wrong Road live on a two-track in a warehouse in Auburn Heights, and the album was privately pressed and released in March of 1971 with Manning taking the pseudonym Captain Hook since he was playing with another band at the time. Almost immediately after, the band broke up again and went their separate ways. Blessed End and Boa were two of the better Doors-influenced bands of the late '60s and early '70s, but whereas Blessed End departed from the overtly ominous overtones of their idols, Boa played it much closer to the vest. Paul Manning had a voice that was almost an exact reproduction of Jim Morrison's; he rumbles and growls his way through about one-third of the songs on Wrong Road (Ted Burris handles lead vocal duties on the rest), while the band is an organ-led blast of minor-key sullenness along the lines of their primary influence. That, however, was about as far as Boa could take their imitation; they lack the danger and depth of the Doors, and while Blessed End seemed to realize they were not that band, Boa seemed to be going for the same dramatic quality in their music and cannot help but fall flat by comparison. They somewhat make up for that, though, with some interesting musical variations and solid songwriting from Bob Maledon, Burris, and Manning. Instead of betraying any debt to jazz or blues, Boa rip through the songs on Wrong Road with an unkempt garage punkiness. It may be messy, often threatening to come apart at the seams, but that gives the music some immediacy. And Boa seem to be having a good time playing together. "Never Come Back" and the title cut are eerie pounders, while "You Don't Want Me Anymore" and "Angelisa" are first-rate ballads. "I Think I Been Had" is simply pure, inept aggression. Several of the songs don't reach the same level of fun but are easily overlooked, and the finest among them, even though they don't match the best garage rock classics, at least melodically better anything by Blessed End. The best song on Wrong Road is "Brave New World," a furious rocker on which the band loses all traces of the Doors, suggesting that had they stayed and grown together, Boa may have created something lasting. As it is, their sole album is only a decently interesting romp.